Hi everyone. Need to head over to the old house to do a bit of work, so it'll be a quick thrift post again. It looks like thrifting is picking up across the board for our friends. We still have to work pretty hard to get our finds, but at least there's more things on the shelves. 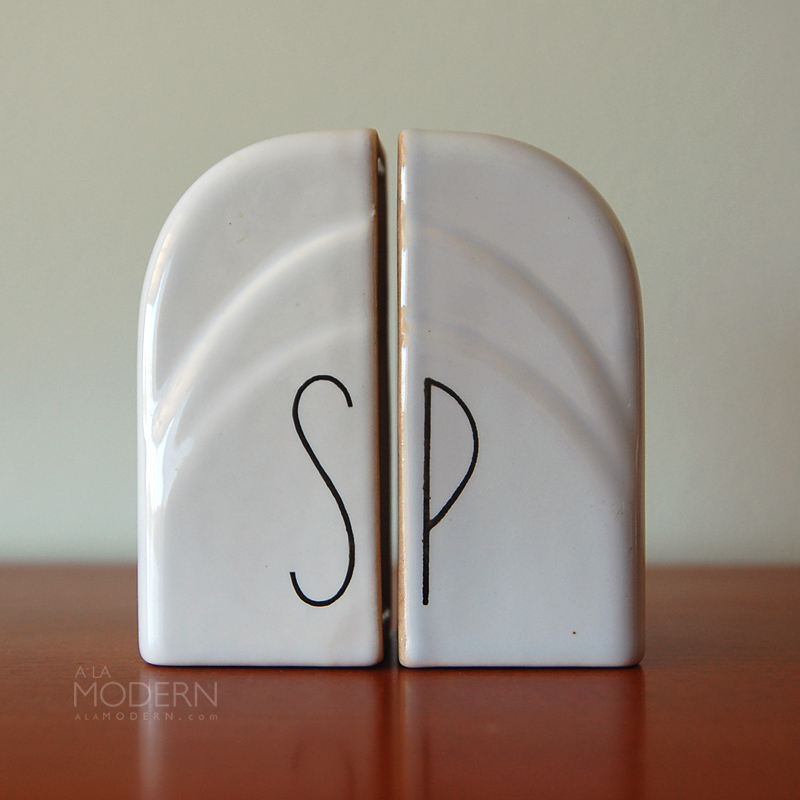 I'd spotted the salt shaker out of this pair of art deco style ceramic shakers at a thrift. I just put it in my cart, hoping to find its mate later. And sure enough, just about when I was going to leave I spotted the pepper underneath a bunch of paper. This seems to happen pretty frequently - we always try and find other missing pieces of a set because more than likely they've been separated. Sometimes, they'll even turn up the next week! Not sure who the maker is on them, but they appear to be from the 1940s. 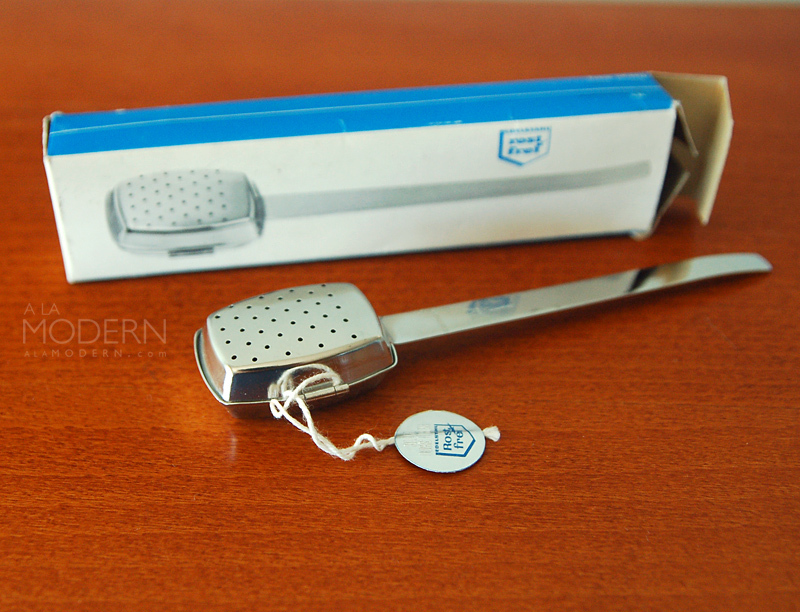 This tea infuser by Rostfrei was still new in the box - it even had its tag still attached. I'm not sure yet if we'll keep this one or put it up in the shop. From the box graphics, it appears to be from the 60s. Its funny how we often talk with our online twitter friends about vintage items, and then we end up finding them the next week at the thrift! This glass jar appears to be Jacob Bang's Primula line for Holmegaard - I say it appears to be, because it's been copied quite a bit. From what we can tell, ours seems to be the real deal - no seams in the glass, and the walls are fairly thin. We picked it up for research purposes, if nothing else. Anyone know more about how to tell the real McCoy from new reproductions? I'd stopped picking up Ken Edwards pieces that weren't marked "KE" - it's just impossible to tell if they're vintage or not. 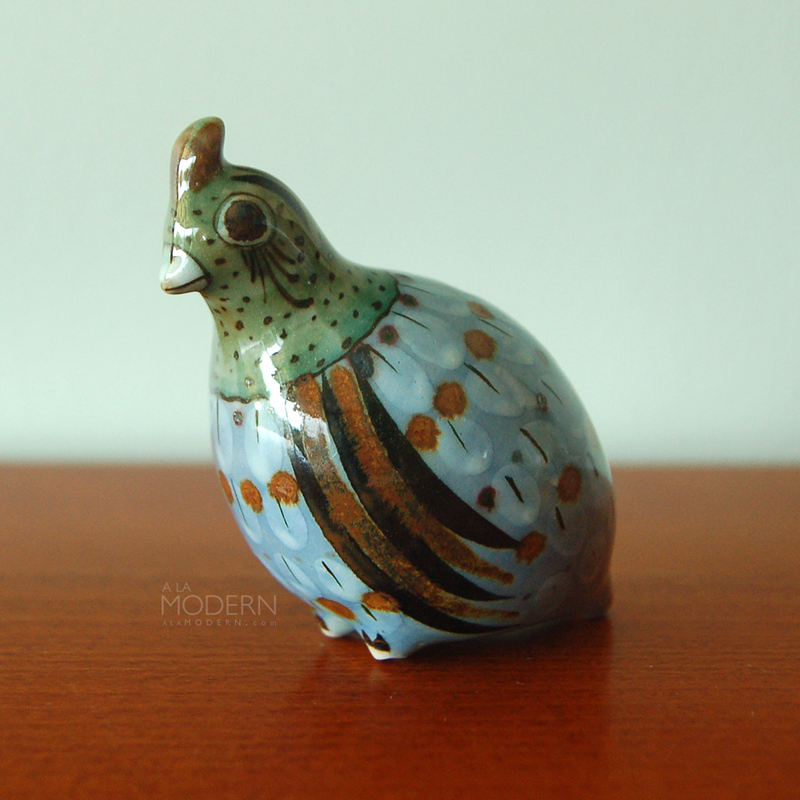 But I made an exception for this little quail. Anyhow, in the main shop we aren't limited by Etsy's somewhat arbitrary "20 years or older = vintage" rule. That's probably where we'll put this one up. 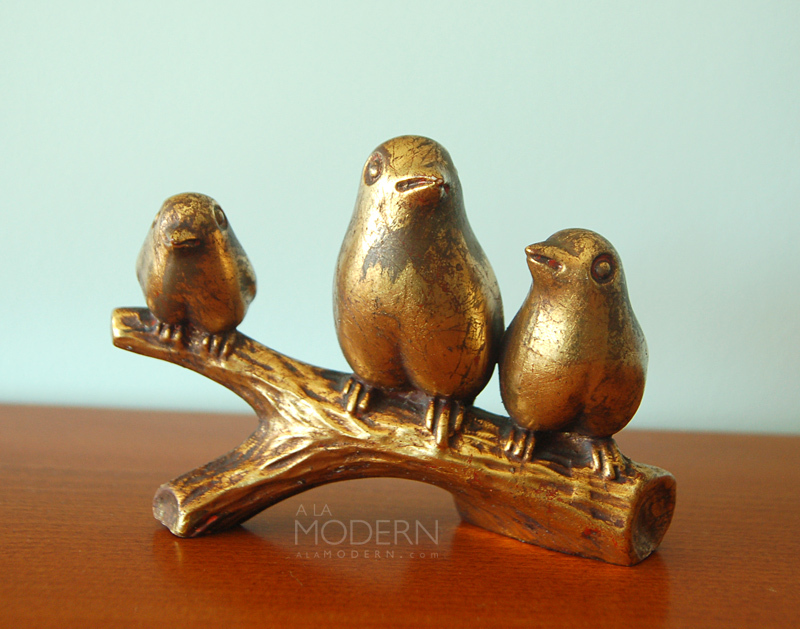 Lastly, it was nice to come across this goldleaf trio of Howard Pierce birds on a log. I had to get it, even though the gold has worn off on a lot of areas. This goldleaf was rubbed on by hand, a time-consuming process. One nice thing about Howard Pierce with the gold leaf is that usually they are not marked - or if they are, the mark is underneath the gold. So more often than not, you might be able to score a HP piece that's not been identified. Some tips for finding the goldleaf items - Pierce is always high-fire porcelain, never plaster or brittle clay. Second, the gold was applied on top of a reddish paint adherent... as far as I know, it was always used. You should be able to see a hint of it even if the gold is in perfect shape. However, note that other companies used this method too- it's not unique to Pierce. Third - Pierce designs are always modern and minimalistic in look. If you see any fancy embellishments on the animals, it's likely not him (and often, it'll be Freeman MacFarlin, another Calif pottery). Fourth, his pieces are almost always "hollow-ware", with a hole on the bottom or other area. That hole is also surprisingly "ragged" looking, and not a perfect circle. All right, hope you enjoyed this roundup. Happy Thrifting! Hi everyone. In the interest of time, I'm doing an ensemble photo for most of our thrifting finds (click on the photo for a bigger version). We had another great Friday. There seems to be more items showing up at thrifts and estates. After a long dry spell of Kokeshi dolls, I found all six of these Kokeshi in one day. I'm fairly certain these are all vintage, but haven't researched them yet. I do know that the "grandfather and grandmother" ones are the "Shingata" style, which employ non-traditional shapes and styles (thanks Bit of Butters for the info on that). The little kid with the pointed head is a little different, but I don't think he's in that shingata style. I think the taller kokeshi in the back may be older than the others. I actually had a fun time explaining to the estate sale folks what these dolls were. The big blue bowl the kokeshi are sitting in is of course a Bitossi Rimini Blu piece from Italy. These pieces are unbelievably heavy and solid. I think it's a bowl and not an ashtray because it doesn't have the indentations that an ashtray would have. I wasn't passing it up either way. Unsure on the dating, but I think this is an older one. Below the DS piece is a Barbara Willis bowl! This is a newer piece from 1996, and while it's not that much to look at compared to some of her other work, it's still a great find. It was not cheap, but I couldn't pass on it. 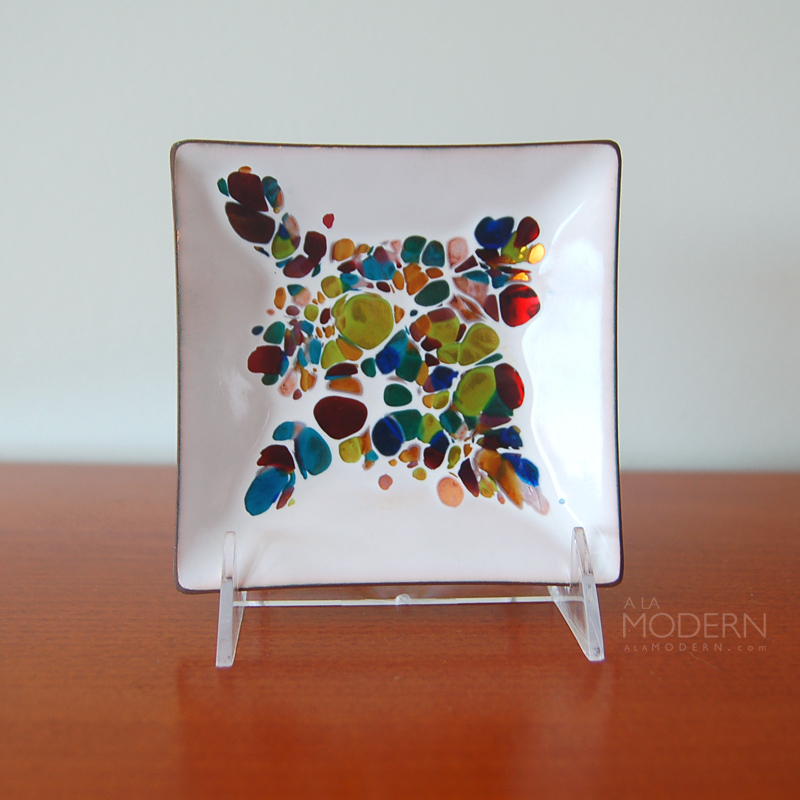 We have another small new Barbara Willis piece somewhere in storage. 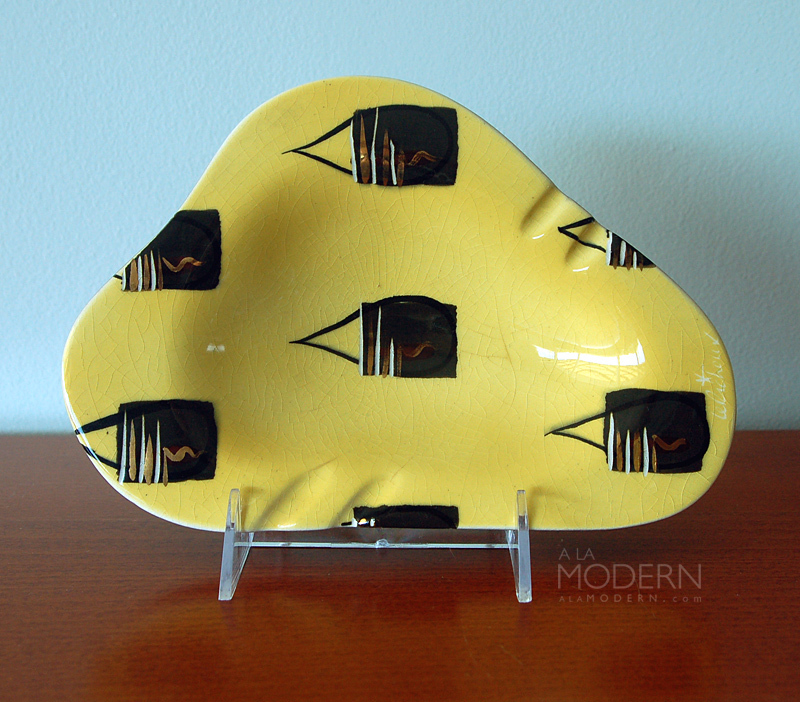 We've found older pieces with the bird decals, but her non-decaled vintage stuff eludes us. Sadly, Willis passed away very recently - more info is on our Potteries of California page if you're interested. The frying pan is an interesting find. 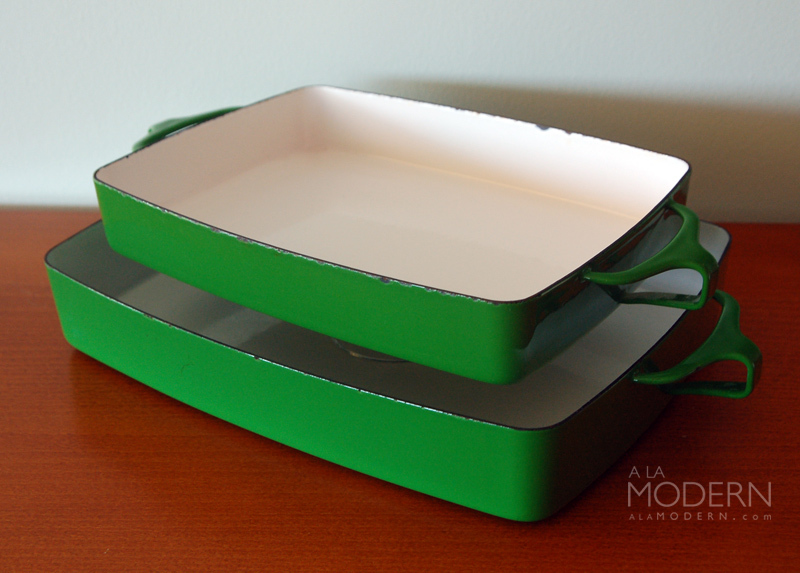 I'd remembered our friend Scott from New Documents / Sllab writing recently about an uncommon Michael Lax cookware line. This aluminum 8.5" #809 pan with wooden handle dates to around 1975-1980 and was designed by Lax for Copco. I think they were produced in several countries - seems to be Denmark, Spain and Japan on quick glance, and ours is the latter. This piece has quite a bit of gunk on it, but I think it'll clean up some. The large chartreuse and dark green vase in the back is from Hull. I probably should've passed on this one, as it doesn't bring in the big bucks like some of the other Hull pieces. It's a three lobe #110 vase. But it was in fairly good condition which is sorta rare for large ceramic vases at our thrift stores, so I ended up getting it. I'll end this thrift roundup with an interesting find. You might remember we found a David Stewart signed handmade bell awhile back. 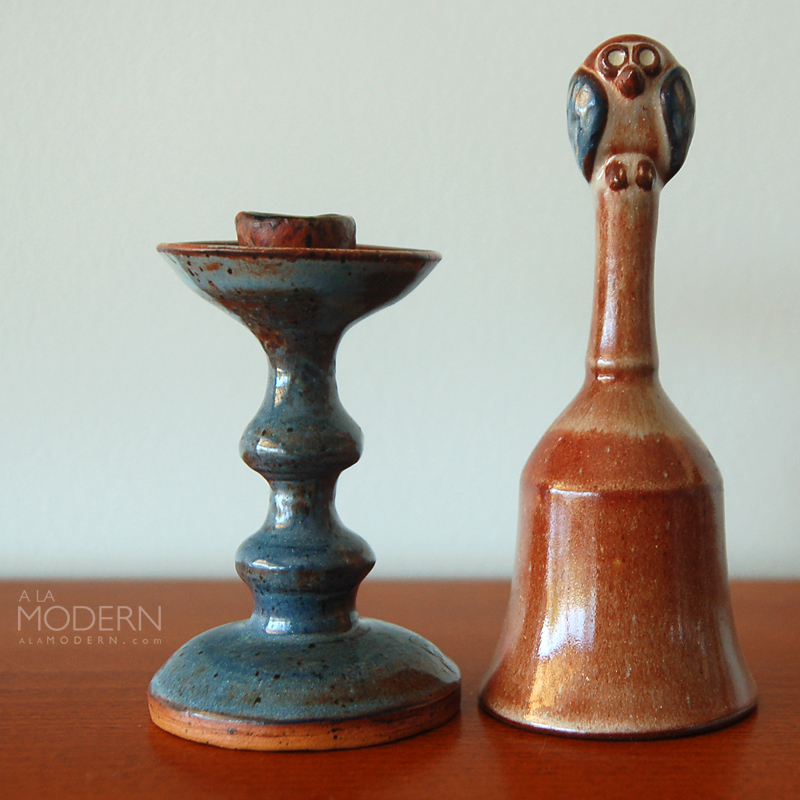 Last week, I came across a single candlestick which looks to share a lot of the workmanship and glaze choice as that bell. However, this one is signed GAIL Stewart. It turns out that she's David Stewart's daughter! She actually studied for a time at Pond Farm too, and as far as I can tell she worked as Marguerite Wildenhain's assistant as well for a time. I think she may have transitioned into painting versus pottery, but she also worked with her father at their shop in old town San Diego. As far as I know, she's still producing artwork. I never would've picked up the candlestick if I didn't know about David Stewart's style. I just sort of took a guess that it might be related. It's always interesting for us to find out about artists in this sort of roundabout way. On that note - we're going to be making a special post in the next couple weeks on an elusive company that we've recently found out more info on. It's a surprise (unless you follow our tweets). Hi everyone. We had a good Friday thrifting run this time - I actually left a ton of stuff behind, but we still did come home with stuff. We're going to spread the goodies out over a couple weeks' posts, but here's a sampling of a few of the finds. 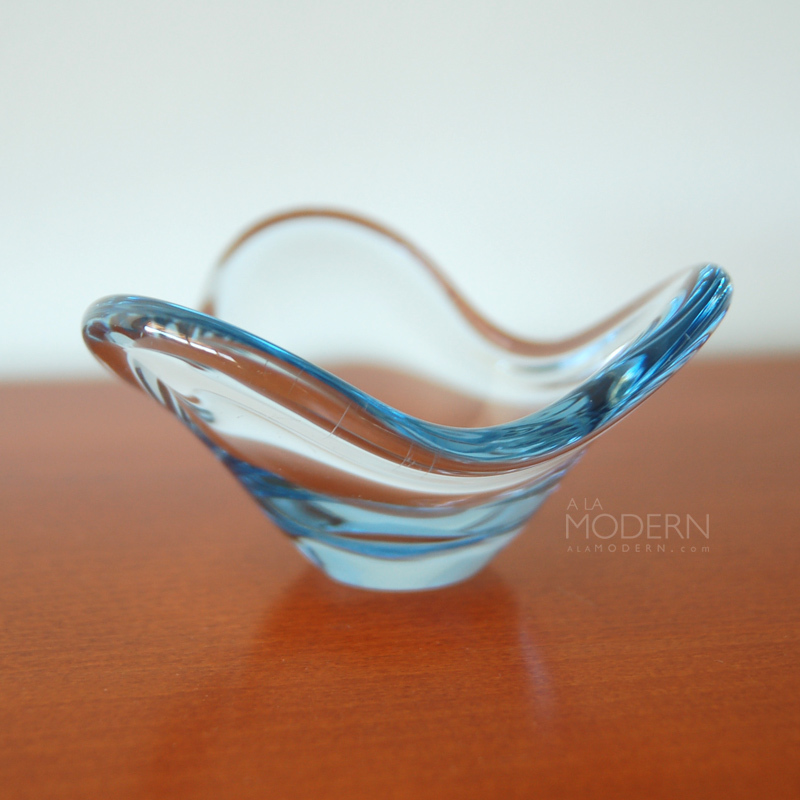 This Holmegaard bowl from Sweden was created by Per Lutken in the 1950s. We believe this line was called "Fionia". It was a nice surprise to find this at a run-down garage sale. 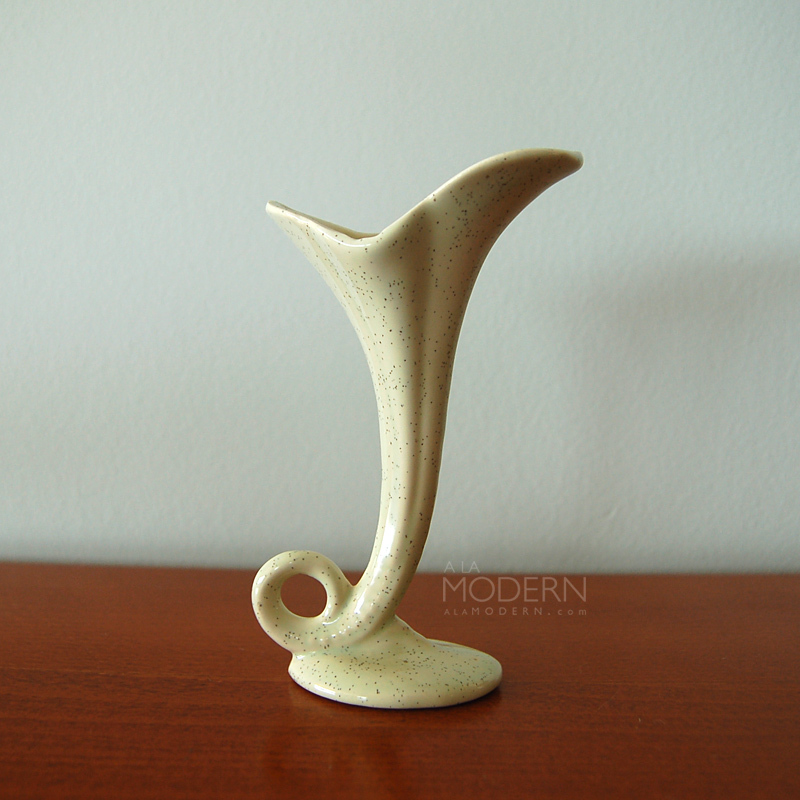 At the same garage sale, we came across this graceful Bauer Pottery bud vase in a speckled green color. 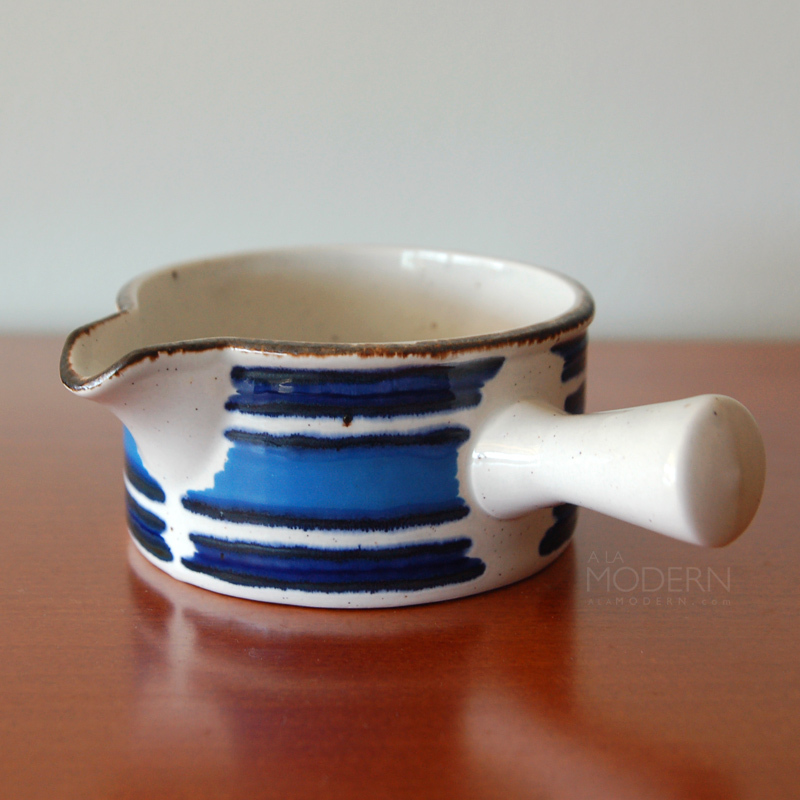 This one is likely based on the molds that Bauer bought from Cemar (another California pottery) and adapted to several of their lines. 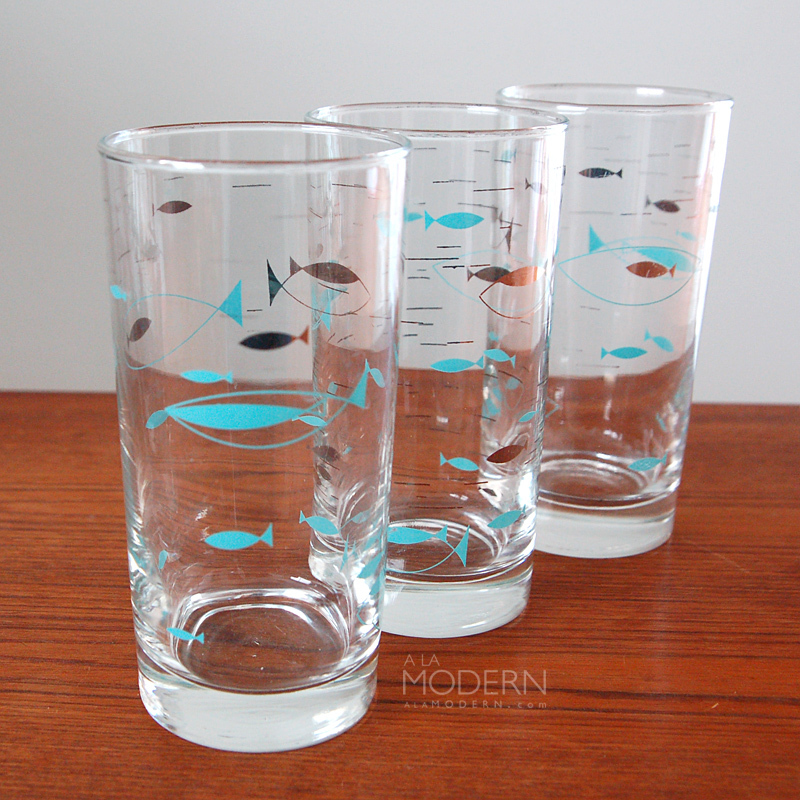 I found the same Libbey "Mediterranean" atomic fish glasses that I came across awhile back. Funny, this was also found in a set of 3! I wonder if it's because one glass gets broken, so they just decide to donate the remaining three. 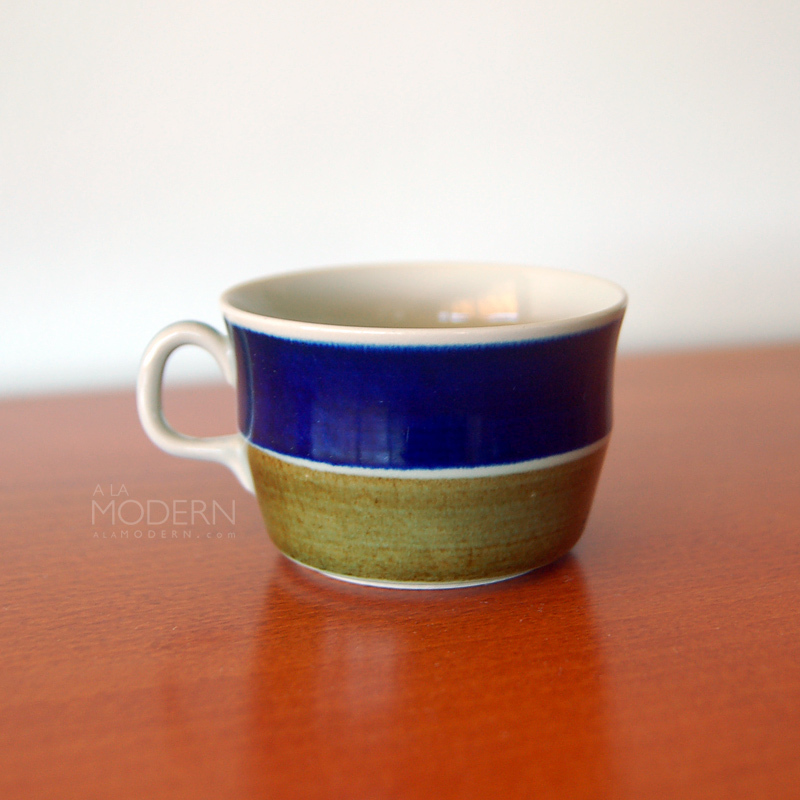 I've been taking a closer look at ceramics from Midwinter from England. There's some popular patterns. I think this piece is a gravy in the Stonehenge shape in the "Moon" decor. 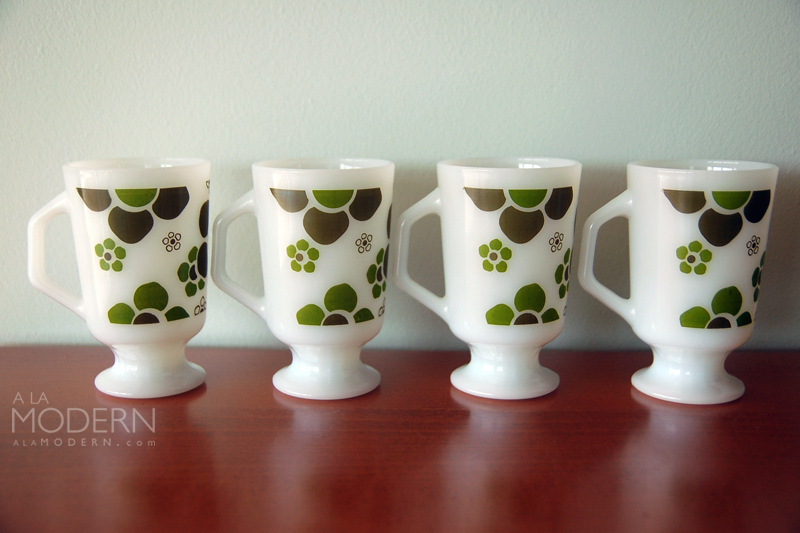 Enamels are one of my favorite thrift items to look for. I've come across Kareka before, but haven't ever purchased because of the condition and price. The rainbow of mini-jewels in the center is kinda cool. Not much info on the company, except that they were from Hyannis in Massachusetts. 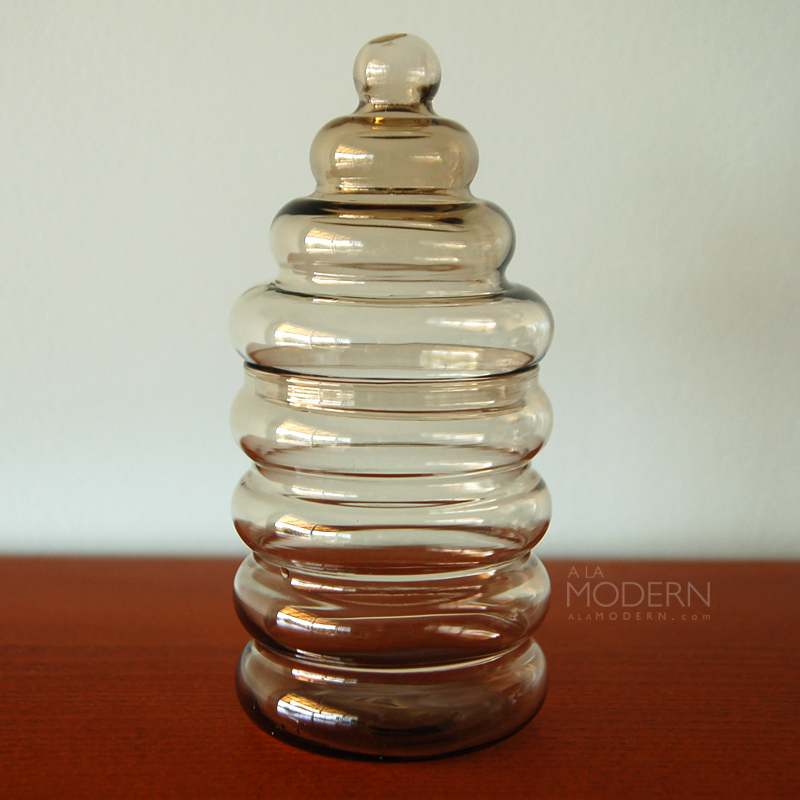 I've been hoping to find an Arkipelago glass candleholder for awhile now. 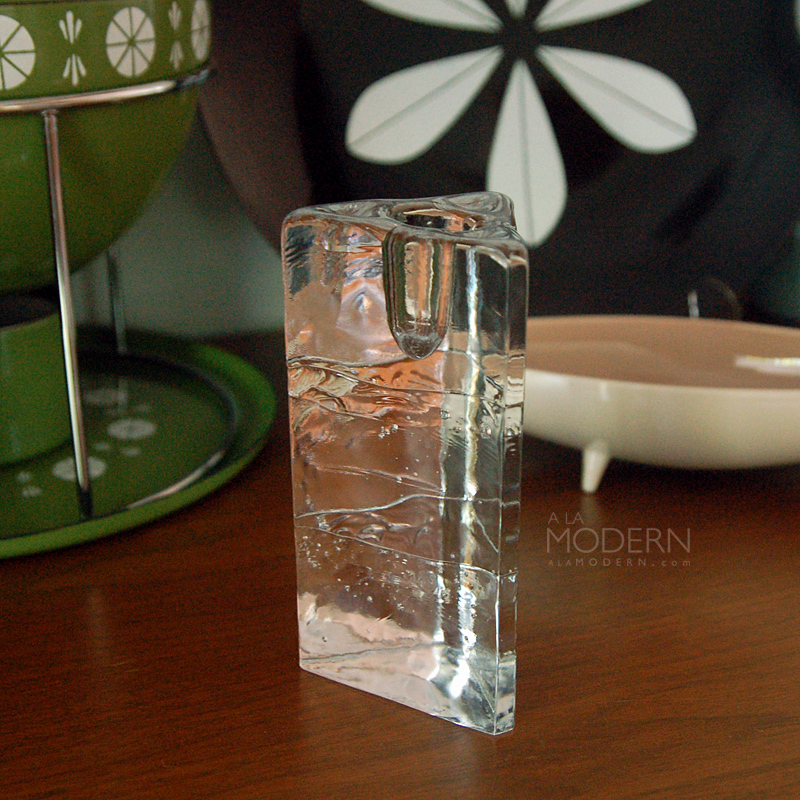 This was designed by Timo Sarpaneva for Iittala. This one is definitely newer (had a barcode sticker on the bottom) but it's still a great find. 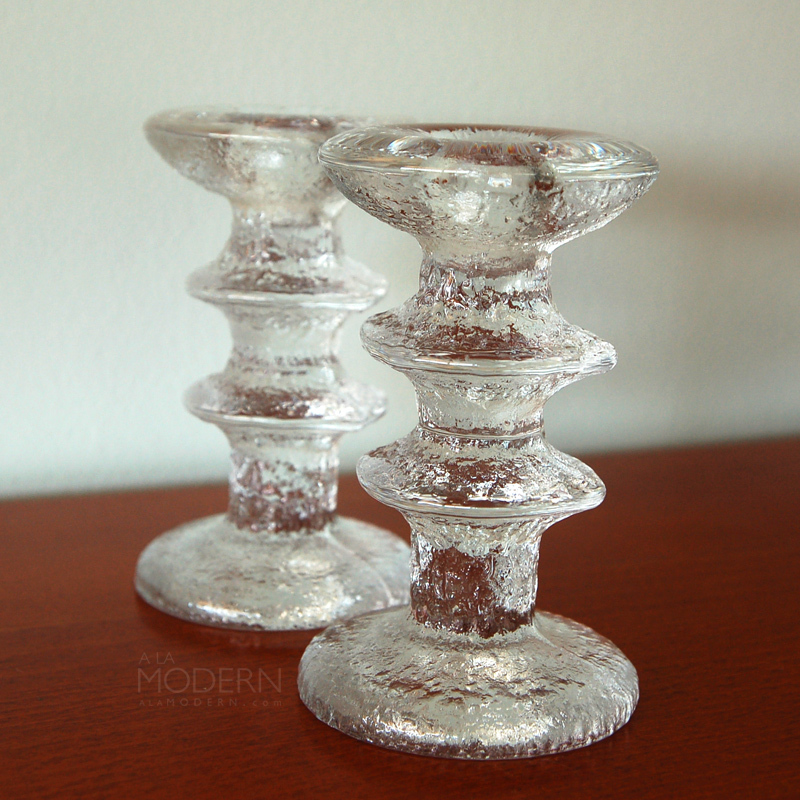 Speaking of Iittala, this only the second time I've come across Festivo candlesticks. These are also originally designed by Sarpaneva, and I was pleasantly surprised to see that they were inscribed with the "TS" on bottom that's believed to be an indicator that they're vintage. However, I was sad when I got home to discover that one of the candlesticks has an enormous crack on the top (it was camouflaged by candle wax!). Not sure yet if we'll keep them. 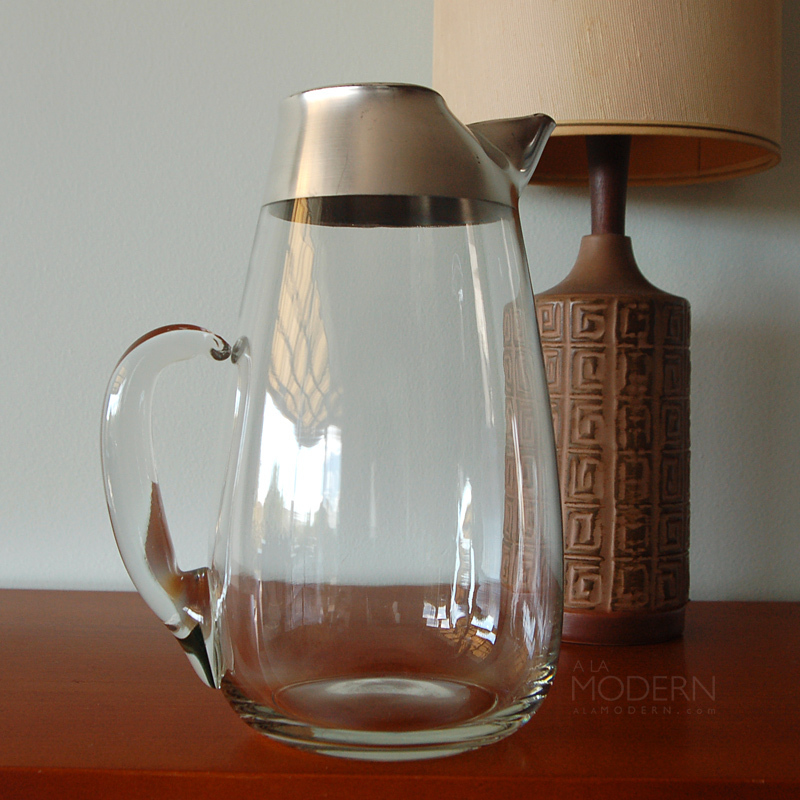 I couldn't believe this Dorothy Thorpe pitcher was sitting there at the thrift. Although it's not marked, I thought more people would know about it by now because of Mad Men. I've actually seen similar ones several times, but they usually have too much silver loss. This one only had a little bit, so I picked it up. Not sure which size this is either... I think it could be the 80oz model, anyone know? OK, hope you've had a great time thrifting! Hi everyone. We had some good luck this week thrifting, but this post is only going to focus on one item. I've never really had good luck with fine art prints or paintings - though I've seen lots of thrifters come home with amazing finds. The problem is that the art pickers in our area are crazy ravenous - I've seen them out there with their jewelry loupe in front of the thrift store stack of paintings. 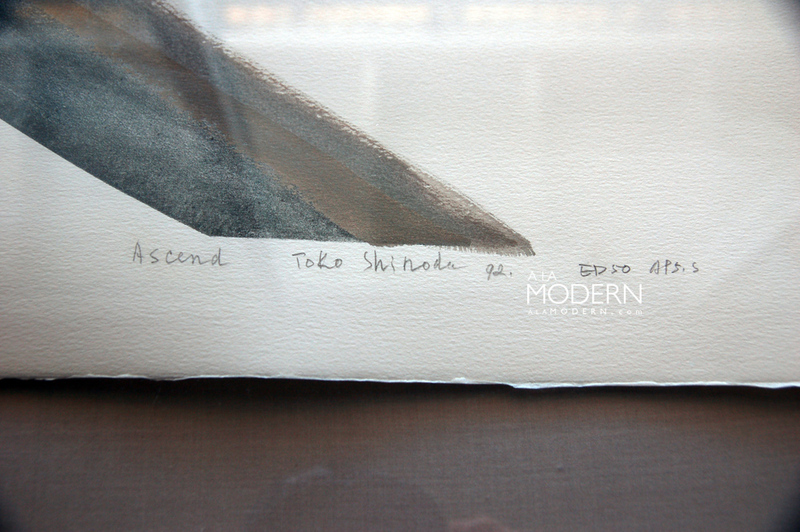 So I was pretty amazed to find this Toko Shinoda hand-brushed lithograph at a thrift last week. It was sitting in one of the rolling carts along with a few other similar prints. I decided to flip through the paintings and prints since I wasn't having any luck with pottery or glass. I rarely look through them, because it's almost always complete junk. This time, there were one or two interesting "modern" signed prints. I didn't think anything of this one, though I liked the brush strokes. I figured if it was anything special, some art dealer-type would've already grabbed it. So I left it and headed for the door. But along the way, I decided to punch in the name Toko Shinoda on the iPhone just for grins. I couldn't believe what I saw - there were lithographs of hers selling upwards of $1000! I made a quick U-turn that probably would've been illegal if I were driving a car, and went back to get the lithograph. I grabbed it and went to the front to pay. At the cashier, a lady in front of me said, "Oh, that's an interesting print." I heartily agreed, though I didn't mention how much I thought it might be worth, LOL. When I got home, I saw that it likely was a real Toko Shinoda lithograph (thanks to Scott from New Documents for the help with confirming that it looks legit). What I'd thought was damage around the edges is likely just part of the handmade paper. The print is called "Ascend" and it's an edition of 50. I think that the "AP 5/5" might stand for "artist proof", though I don't have much experience in this. I haven't done that much research on Shinoda yet, though I know she's still alive and approaching 100 years of age! 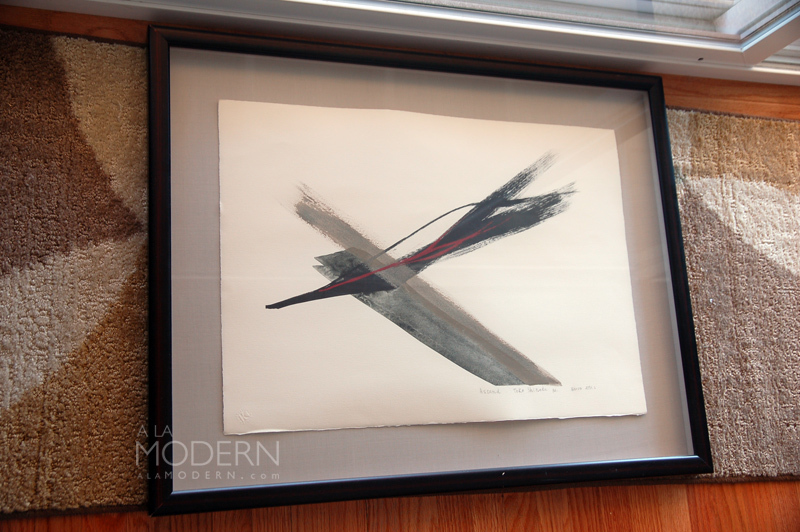 Her works focus on sumi paintings and prints, with abstract brushstrokes like this one being a very common style for her. She actually adds brush-stroke painting to the lithographs. Since everything seemed to say that she's extremely well-known in Japan, I was interested to see if my mom had heard of her. She hadn't, though she was impressed with the find. She also noted that the characters in Shinoda's name are actually "Toukou" (where the "o" is a long "o"), which means "red peach", and that this wasn't a given name but her artist name. You can read more about Shinoda on Wikipedia, and on the other gallery sites that display her work. I'm trying to figure out how we might sell this type of print in our shop - it may need to be re-framed, though I'm not sure yet. In any case, we're pretty thrilled to have found it. It's the first really valuable print that I've found. It also just goes to show that you never know what you'll find when thrifting, even in places where it seems highly unlikely. Happy Easter and Happy Thrifting! Hi everyone. 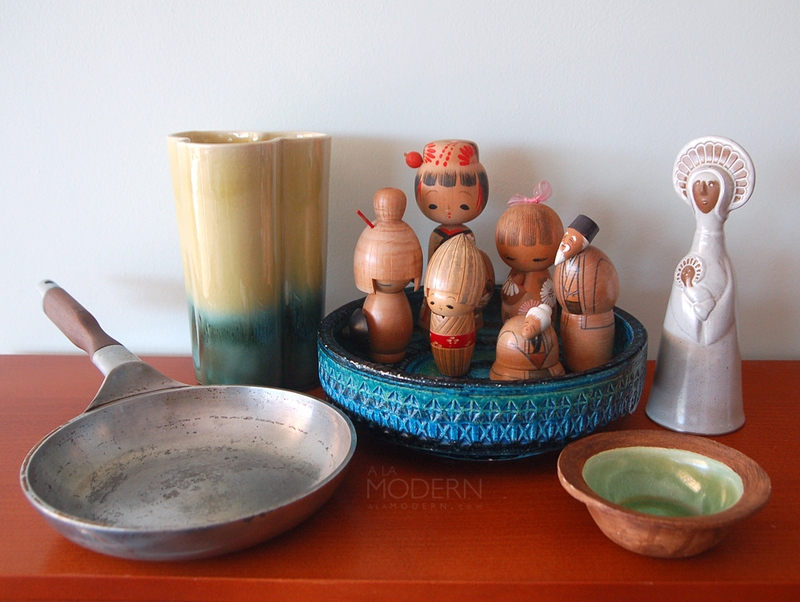 We had occasion this week to travel beyond the "Orange Curtain" and do a bit of thrifting. That's Orange County, for the non-SoCal folks. Not much found in the several thrifts we visited. One thing I noticed is that many thrifts had closed or moved, since the last time I was in the area about a year ago. Interesting - I've seen a lot less change in my usual thrifting haunts. 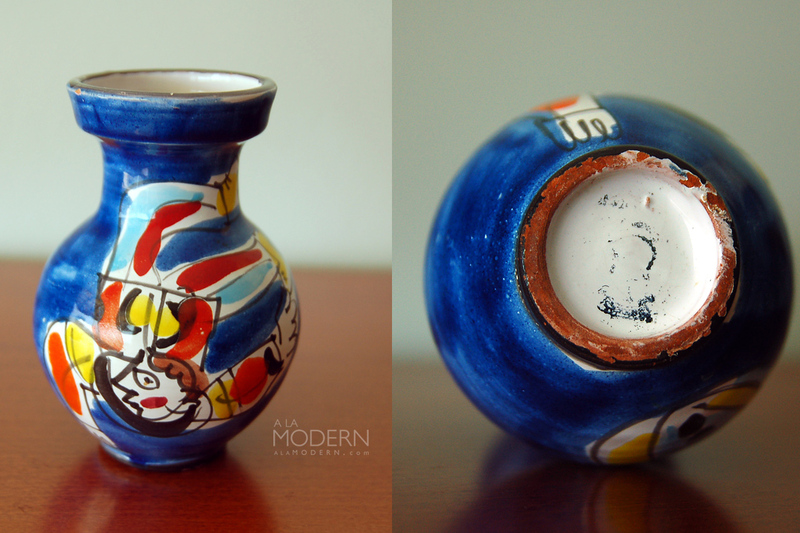 I immediately thought this little vase was a De Simone or a Nino Parrucca. However, it doesn't have the usual marks - there does seem to be the remnants of a mark on bottom, but I think it's on the outside of the glaze. I'm not entirely certain this isn't a modern production made in the style of those two makers - anyone have an idea? 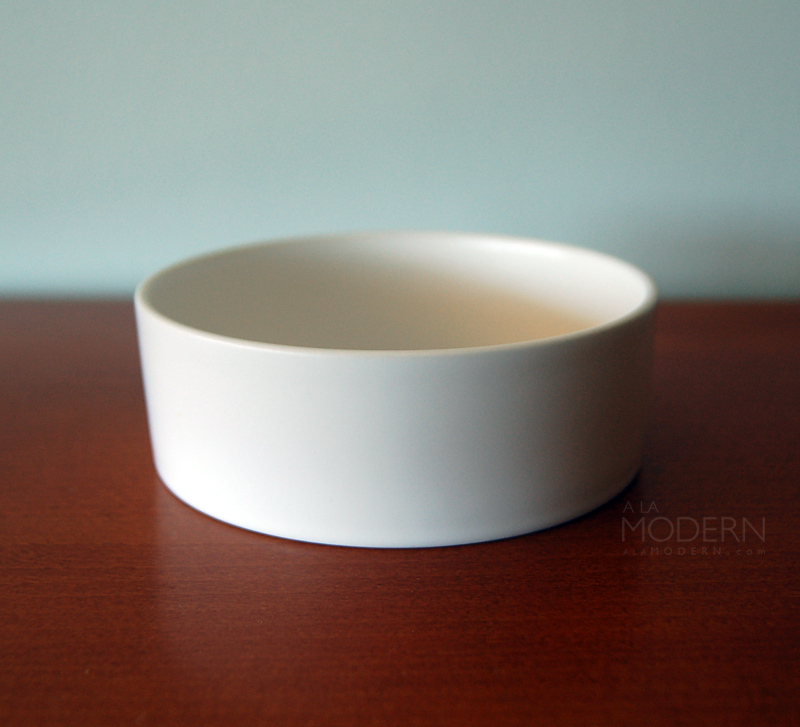 This simple white bowl caught my eye, because I knew that some of the Swid Powell stuff has a lot of value (just look up the Michael Graves teapot). This one is a Calvin Klein line, I think called "Stoneware" or "Khaki"? I haven't done full research on it yet, but don't believe it has a ton of value. Last up - here's that funny story I was promising. 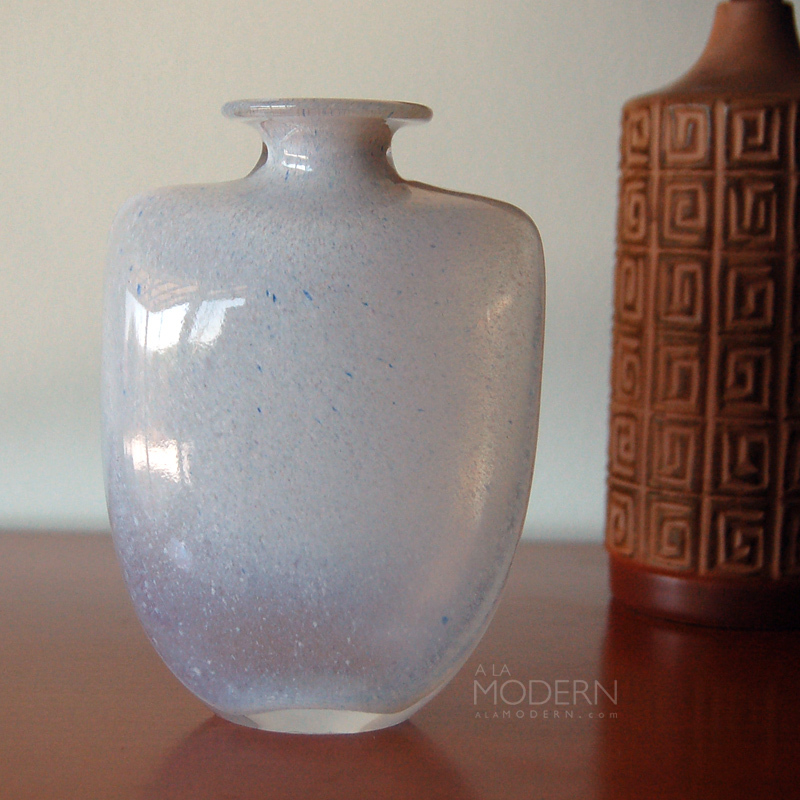 I picked up this beautiful Kosta Boda vase designed by Kjell Engman. The swirling snowy inclusions and wonderful shape are really nice, the pic doesn't do it justice. I'd seen this piece at a thrift near us, but was put off by the price of $10. I'd recognized the Kosta Boda name inscribed on bottom, but couldn't figure out the rest. When I got home, I did some research and found out it was a piece with decent value by Engman. I didn't think anyone would poach it since it was pricey for a thrift, so I waited until Linda got home and then we headed out to the thrift to pick it up. I walked in the door, went immediately to the houseware section and just grabbed the vase in front of about 3 people browsing. They were surprised... this always happens to me at thrifts. I feel like anything I do is heavily scrutinized by the rest of the shoppers - or maybe that's just me being paranoid. Anyhow, we went to pay. Two of the folks who had watched me grab the vase were in line behind us. I should explain - the area we live in has a large population of Chinese-American people. I chatted with the clerk, who commented the vase looked really nice. After we were done, Linda, who can understand Chinese, said that the lady told her friend "I can't believe they just bought that vase for $10!" They were going on about what crazy suckers we were to pay that much for a cheap glass vase. Interestingly, I'm not fluent in Spanish, but have a pretty good idea about what's being said usually. And I've had the same thing happen to me at thrifts, but with the shoppers speaking in Spanish instead. This kind of thing - it makes me so HAPPY. As it should for any serious thrifter. We WANT everyone to think we're nuts to buy this stuff, and I could care less if people talk behind my back. Bring it. It keeps the uninformed bears from poaching from the honey holes. Seriously, stories like that give me hope that there's still goodies to find at thrifts, even with the increased pressure on them from resellers. Happy thrifting, you informed bears!